I have shared chilli garlic chutney recipe ealier in my blog. It is basically a spicy chutney with a garlic flavour. It goes well with Idli, Dosa, Kuzhipaniyaram..etc. I have used this chutney as a spread to make this yummy dosa. The dosa tastes really good it is spicy and also a flavourful crispy dosa. 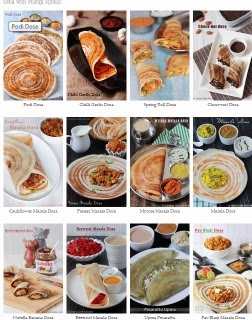 You could check my other dosa with different fillings such as Mysore Masala Dosa, Masala Dosa, Beetroot Masala Dosa, Broccoli Masala Dosa, Pav Bhaji Dosa, Paneer Masala Dosa, Mushroom Masala Dosa, Chicken Masala Dosa, Nutella Banana Dosa, Palak Paneer Dosa, Choco-Nut Dosa and Spring Roll Dosa and Vegetable Egg Dosa. The plain dosa recipes Curry leaves Dosa, Spinach Dosa, Beetroot dosa, Pumpkin Dosa, Tomato Dosa, Cucumber dosa, Onion rava dosa, Neer Dosa, Soyabean dosa, and Tricolour dosa. Heat the dosa pan and slightly grease the pan. Pour a big ladle full of batter and spread as thin concentric circles. Drizzle half a teaspoon of oil and allow to cook. Once the top of the dosa get cooked spread the chilli garlic chutney on top of dosa using backside of the spoon. Allow to cook for further fifteen to thirty seconds till the dosa gets crispy and golden colour at the bottom. 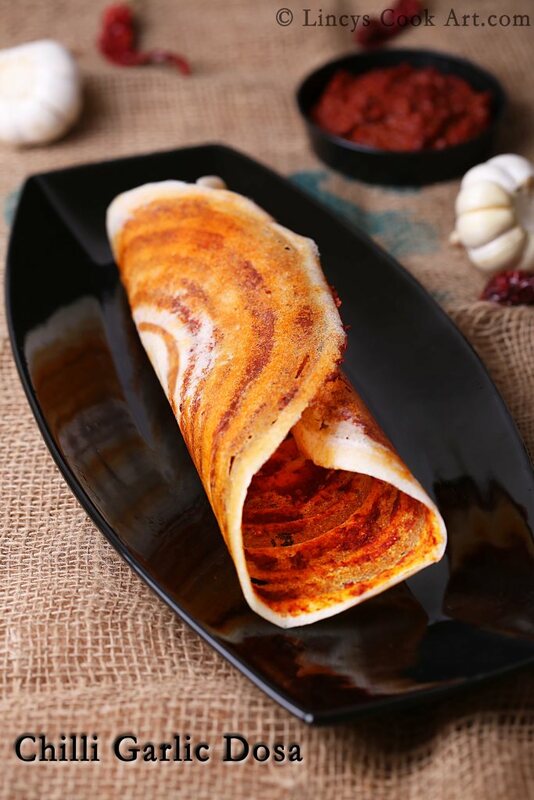 Roll the dosa as you desired like a roll or triangle and serve with chutney or sambar. But this dosa doesnot require any dip as it has a spicy chutney spread-ed on inside.